Zachary Mosner, an assistant attorney general, said Brewster hasn’t “paid a dime” of taxes since August. Brewster is attempting to save his Montvale Hotel by filing for bankruptcy protection to restructure its debts. A bank holding a $2.9 million note on the hotel also asked the judge Thursday to appoint an independent trustee to watch over the Montvale’s operations. As the arguments over the Montvale unfolded, Brewster’s attorney, John Munding, said the hotel’s owner needs access to the business’s frozen cash accounts to pay bills and employee wages. The historic 33-room hotel at 1005 W. First Ave. is in danger of closing, Munding told the court. 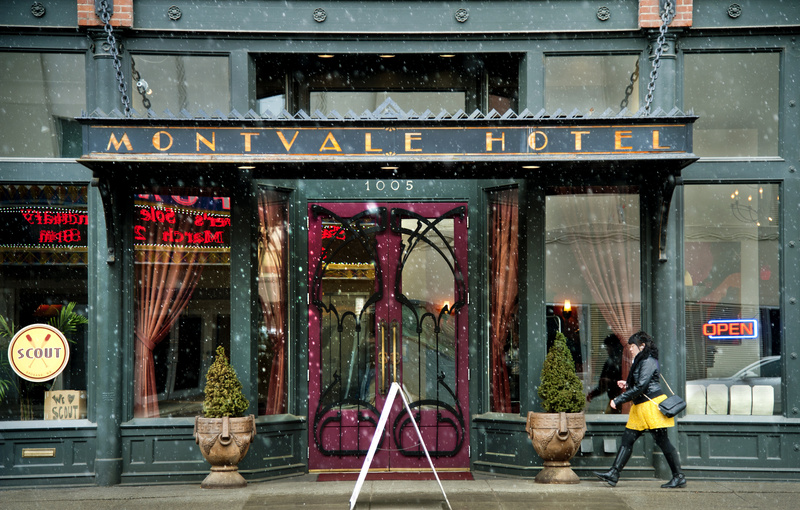 “We don’t need another dark, vacant hotel,” Munding said of downtown Spokane. He said the city has had its fill of such troubles and pointed out the problems surrounding the Ridpath Hotel. Brewster, who did not take part in the court hearing, purchased the Montvale building in 1998. His purchase was a speculative move with an altruistic motive, Munding said: Brewster wanted to help revitalize an area of downtown with a history of deep economic problems. At one time Brewster also owned and refurbished the Holley-Mason building and the Hutton Building in downtown Spokane. The Montvale’s reopening dovetailed with the renovation of the Fox Theater, the opening of The Knitting Factory concert venue, and moves to close the Otis Hotel. Restaurants and bars occupy street-level storefronts in the Montvale building, and Munding said hotel guests are important customers that help to keep the small businesses open. Mosner didn’t argue about the economic and community value of the Montvale, but said he wanted the hotel under new management to protect the state’s stake as a creditor owed taxes. He said Brewster transferred ownership of the Montvale to another company last fall to escape or confuse creditors in other bankruptcy cases. “The facts strongly substantiate a fraud upon the court and creditors,” Mosner told U.S. Bankruptcy Judge Patricia Williams. Williams called for another hearing in two weeks to help determine whether a trustee should be appointed or if Brewster should be allowed to manage the hotel in a turnaround effort.